Provide comfort for the family of Theodore Vandelaar with a meaningful gesture of sympathy. Theodore Gerard "Ted" Vandelaar was born on December 16, 1930 in Helmond, Netherlands and passed away peacefully on January 30, 2019 in Squamish BC. He is survived by his wife Catherine, son Michael (Isla), daughter Doreen (Wayne), and grandchildren Anders and Jillian. He is also survived by his brother Henry (Susan) and sister Anne and numerous nieces and nephews in Canada and the Netherlands. Ted immigrated to Canada with his family in 1950 and spent time working in Ontario, Alberta and Ocean Falls, BC. He moved his young family to Squamish in 1960 and worked at Woodfibre as a millwright until his retirement in 1989. 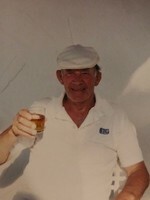 Ted was an active golfer and longtime member of Squamish G&CC and spent many good days on the course with friends. He was an avid bridge player, an unsuccessful fisherman, and an enthusiastic armchair hockey fan. Ted always had a smile and had many friends, especially his gang at Starbucks. We are especially grateful to Cees for his kindnesses in driving our Dad to Starbucks on many occasions in the past few years where they would reminisce. We would also like to thank Dr. Cudmore for his years of exceptional care, and the staff at Shannon Falls retirement home for their kindness. There will be no service by request. Please say or do something kind for another person in his honour. Provide comfort for the family of Theodore Gerard Vandelaar by sending flowers.